The taste of fresh sliced melon washes the palate and refreshes the spirit. A special blend of organic white tea with all the antioxidant power that white tea leaves have to offer and fresh cantaloupe essence and jasmine. Perfect as an iced tea or after a meal. As far as I know, there are no figs in it, but, there is something about the aroma of this tea that mentally transports me to the fig orchard that I spent many an hour in as a young child, picking sun-ripened figs and eating them right there in the orchard. But, I do want to clarify – this tea DOES NOT taste like figs. It doesn’t even really smell like figs. There is just something in the aroma that brought that memory to the surface for me. 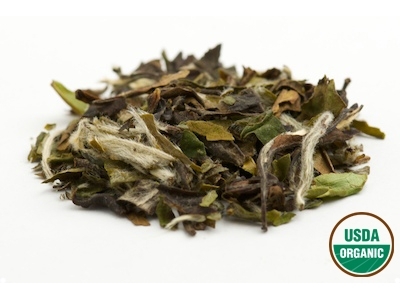 The white tea base is – not surprisingly – rather delicate but I can definitely taste it – it tastes refreshing and light. There is a pleasant balance between tea and melon taste. The melon tastes juicy and sweet – a very pleasant fruity taste that complements some of the softer features of the white tea. As tasty as the melon flavor is here, there is a part of me that wishes it were not quite so strong so that I could taste more of the jasmine, which just sort of lingers – whispering ever so softly – in the background. It is a nice touch, but, this jasmine lover wants just a little more of jasmine’s sweet song to dance upon my palate. This is a delicious blend that is very refreshing. It is very good hot, but, I strongly suggest trying it iced. It’s truly amazing as an iced tea and has become one of my FAVORITE teas to serve iced. And I’ve tried a lot of teas!